The Head Nanau corner itself was about Doraemon. 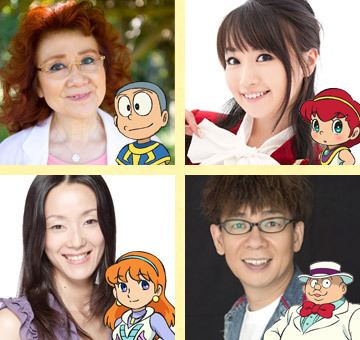 As some of you may know, Nana has a role in the most recent Doraemon movie. As with most movies, they held events for it. The one main thing you that will always appear for movies aimed at kids would be — mascot costumes. At first, Nana compliments the people in those costumes. These people seem to be moving and dancing nonstop during the entire event, despite having limited vision. Anyway, there’s a part where they act out a little play. The mascot costume does the physical acting whereas the seiyuu voices them. For the most part, it’s a normal course of event for both seiyuu and mascot costume actors. Doraemon fell flat on his face. The theme for this week’s quiz is “March.” They’re all random questions sent in by listeners with regards to March. As usual, I’m going to skip over the questions… At any rate, she got 15 scratch cards. Is there a chance for a hit…? We shall see in the end. Following up is the mail reading corner. 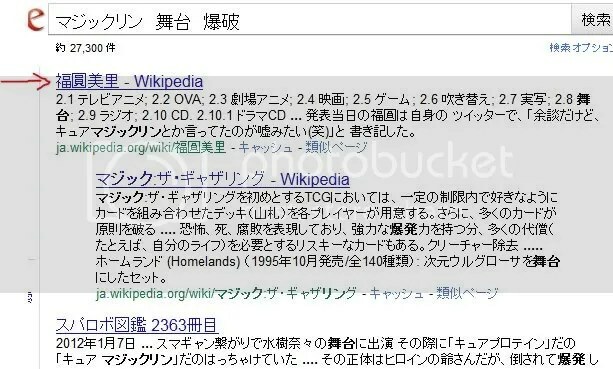 Remember how last week, someone sent in a letter saying that if you searched “Curry daisuki 32 year old”, her name would show up as the second result (3rd for me, for some reason). This week, there is more of these “funny” search results. 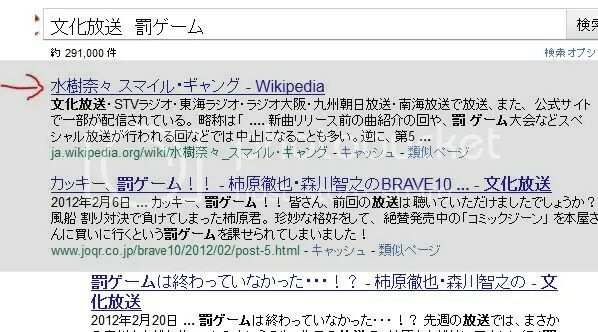 If you searched “tomato kinchan noodle and M” (トマト　金ちゃんヌードル　ドM), you’d get Mizuki Nana as first on the search engine. And yes, it’s true. 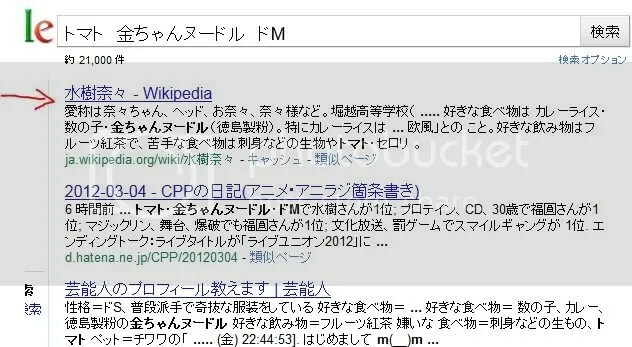 If you searched “Magiclin stage destruction” (マジックリン　舞台　爆破), Fukuen Misato will be first. The first two keywords, I can understand (so does Nana and Misato), but destruction? XDD;; Misato reacted to “destruction” obviously, and Nana’s first reaction was “Misato, what did you do?” XDDD Misato then wonders how the person even came up with these keywords. Lol. Nonetheless, her wikipedia page does come up. Hahahaha. Finally, “Bunka Hosou and Batsu Game” will result in Smile-Gang being first. I’m not surprised about this one, though Misato and Nana wonder if other programs under Bunka Hosou does not have Punishment games… Their conclusion is that they probably do, but simply doesn’t rival Smile-Gang in leaving behind a big impact. They suggest that people should try “radio and Batsu game” (to broaden the scope of search) to see if they still get the same results. I tried it, and no. Nothing related to them show up in the first 5 results. Proceeding toward the conclusion… We get the official “Live Union” announcement. Yay? Except we all knew that already, right? because you’ve got to have been living under a rock not to know Doraemon-> tell me about this, I’ve got friends who doesn’t even know that Doraemon is a manga/anime Whatever happened to civilization? Now that I think about it, I suppose Doraemon isn’t very well-known in North America… Even though his fame could rival Hello Kitty elsewhere. But I also caught the news up Nana starring in Doreamon voicecast. But which role does she have? As a narrator? I also found the a website of the said event (http://moca-news.net/article/20120303/201203031458a/01/) One thing that struck me cleary, the photographer really like Nana. Because In the photo gallery there are more photoshots of Nana then entire cast combined. About Live Union … ano~ isnt it basically the same as Live Journey? I mean I have read it’s also a nationalwide Live trip. Anyone preordered the Live Journey x Live Castle yet? Nana’s role is that of a very young girl by the name of Coron (or Koron). I haven’t managed to to get a chance to watch the Pokemon movie yet. ^^;; I will definitely one day watch it though! If just to see what Mijumaru did to become Nana’s second favourite Pokemon in the entire series (though I suspect a large reason is due to Misato being the seiyuu behind Mijumaru XD). Her favourite is Pikachu — though she didn’t reveal why exactly. LOL I’m starting to wonder if the scratch cards are rigged.